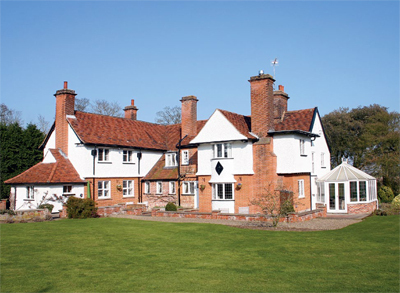 Swans Nest is a Grade II listed country property with Tudor origins on the edge of Westerfield in Suffolk. The property has been extended and altered down the years and now offers light, well-laid out family accommodation. The house has two elegant principal reception rooms with fireplaces and a comfortable conservatory. The spacious kitchen has an Aga with the cellars beneath, while an oak staircase leads to the five main bedrooms including the master suite, four bathrooms, and the sixth bedroom, which is currently used as a study. Outside are lovely gardens with a pretty natural pond and well-kept lawns, and a selection of mature trees including an ancient mulberry tree – a croquet lawn and a tennis court also add to teh charm. The terraces face west and an area of orchard has apple, cheery and greengages; the land comes to around three acres. Swans Nest is located on the edge of Westerfield, and Ipswich is less than two miles to the south. Local schools are excellent and shopping and transport links convenient. The guide price is £1.1m. For further information please contact Jackson-Stops & Staff on 01473 218218 or visit www.jackson-stops.co.uk.